Scheduled for Sunday, March 3! 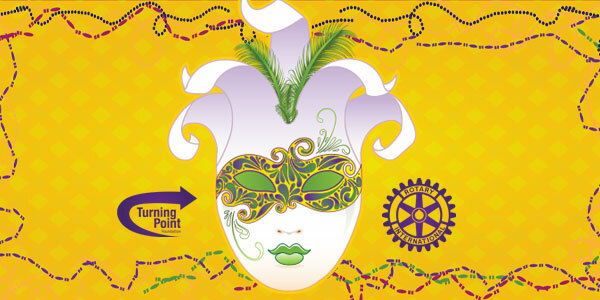 Rotary Ventura South will host its 4th annual Mardi Gras fundraiser in support of Turning Point Foundation on Sunday, March 3. The gala event begins at 3:00 p.m. at the Tower Club, 300 E. Esplanade Drive in Oxnard, and will feature traditional New Orleans jazz and food, silent and live auctions of exciting items, and a view from the foothills to the Channel Islands that only the Tower Club can provide. Turning Point Foundation has operated community-based mental health programs in Ventura County for over 30 years. Their programs address the full range of personal needs, including a homeless shelter to meet necessary physical and safety requirements, supported housing to provide decent, affordable housing and rehabilitation and socialization centers to provide meaningful, productive activities, companionship and a sense of purpose. Because of the myths and stigmas attached to mental illness, many people struggle with its effects alone and unaware that their symptoms can be controlled by medication and the functional problems they experience can be addressed through rehabilitation and support services. Turning Point works with clients to reverse the devastating effects of their illnesses, such as job loss, homelessness, isolation, addiction, incarceration, and even thoughts of suicide. Tickets for the event are $50, and there is also a variety of sponsorships available for businesses and individuals. Contact Suki Sir at Turning Point Foundation (ssir@tpf-vc.org / 805-947-5400). Proceeds from the event will go directly to Turning Point Foundation and other charitable causes supported by Ventura Rotary South. As they say in New Orleans, “Laissez Les bon Temps Roulez” (Let the Good Times Roll)!